Texting has become the most popular form of communication among young people in the US, research indicates. The study, by the Pew Internet and American Life Project, suggests that texting has eclipsed mobile phone calls among teenagers for the first time. More than 30% of teens send more than 100 texts a day, it shows. 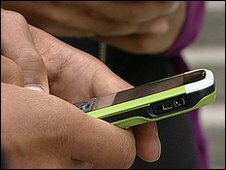 Researchers say more payment plans offering unlimited texts have helped to create the surge in the US, which used to lag other parts of the world. The study found that two-thirds of teenagers are now more likely to text their friends than call them on the phone. Girls on average send or receive more texts than boys - 80 messages per day compared to 30. "Texting is now the central hub of communication in the lives of teens today, and it has really skyrocketed in the last 18 months," said Amanda Lenhart, a co-author of the report. "The widespread availability of unlimited texting plans has transformed communication patterns of American teens." "This is a shift in the location and style of teens' communication with friends, not necessarily a radical change or expansion of it," she added. The study's authors said teenagers preferred texting to phone calls because it could be carried out under the noses of parents, teachers or other authority figures. "We have kind of hit a tipping point where teens now expect other teens to respond to text messaging and to be available," Ms Lenhart said. "There is definitely an element of text messaging that fits so seamlessly into their lives." However, the study found that phone calls are still teenagers' preferred method for contacting their parents.